For kids who dislike ghosts, ghouls, and skeletons, Halloween can be a rough season. It’s hard to know what’s lurking around the corner at pumpkin patches, corn mazes, trunk or treats, and even the local grocery store. Still, that doesn’t mean you have to skip Halloween altogether. There are plenty of ways to celebrate Halloween without bringing in the darker side of the season. For some kids, carving pumpkins can be too spooky, especially with their crazy faces, but what’s stopping you from painting a pumpkin? Choose some bright colors and focus on funny faces or cute patterns, such as dots and stripes. If you’re having a Halloween party, throw in a traditional bobbing for apples game. While it may not be the most hygienic, kids will have fun trying to capture the apples with their mouths. Check your local newspaper or activity guide for a pet costume parade. These parades are usually free from spooky costumes and, instead, focus on adorable animals in silly costumes. Many fall festivals are held during the day and focus on the fun side of the season. To ensure the festival will be free from spookiness, consider attending one sponsored by a church where it’s less likely that ghosts, skeletons, guts, and gore will make an appearance. Read a story such as The Legend of Spookley the Square Pumpkin which focuses more on accepting your differences and fitting in than trying to scare kids on Halloween. Another cute Halloween book is Pumpkin Cat by Anne Mortimer. Invite some friends over for a costume party where only fun, happy costumes are allowed. Consider coming up with a theme, such as favorite cartoon characters or storybook characters. Rather than going trick or treating around your neighborhood, set up a time where you can trick or treat at the homes of different friends and family members. Do it during the day so you won’t see any scary masks or other costumed people out and about. Rather than making a spooky bat, Frankenstein, or other scary craft, just pull out some orange and black paint and construction paper, along with some glue and googly eyes, and let kids come up with their own creations. Monsters don’t have to be scary. Focus on crafting monsters with silly faces rather than scary ones. You can give them cute names too. Go outside and gather some leaves. Make leaf creatures by adding eyes, noses, arms, and legs or use the leaves to make collages and other fun pictures. Cut out different shapes from a pumpkin and use those shapes as stamps. Dip them in paint and press them on paper to create unique works of art. Slime is often associated with Halloween, but that doesn’t mean it has to be spooky. Make or buy some slime and have fun getting your hands messy. Slowly introduce kids to some of the spookier aspects of Halloween through a themed sensory bin. You can throw in a few small plastic bats, ghosts, or spiders if your child can handle them in small doses. You may also want to add plastic pumpkins, some dirt, or black beans. For extra texture, add some orange or black water beads. One of the best parts of Halloween is getting to trick or treat, but you don’t have to find candy in traditional ways. Hide candy around your house or in your yard and send kids on a fun scavenger hunt to find it or set up different trick or treat stations in each room of your house. Try Help Teaching’s 100 Educational Pumpkin Activities to bring math, science, and literacy practice to the holiday. If you do decide to head out to some more traditional Halloween events, be sure to call beforehand to see if there will be any spooky elements there and walk ahead of your child in any corn mazes or on any paths so you can be prepared to turn around if any scary elements appear. You may also want to bring along some head phones or a pair of sunglasses to help your child tune out the spooky sights and sounds. 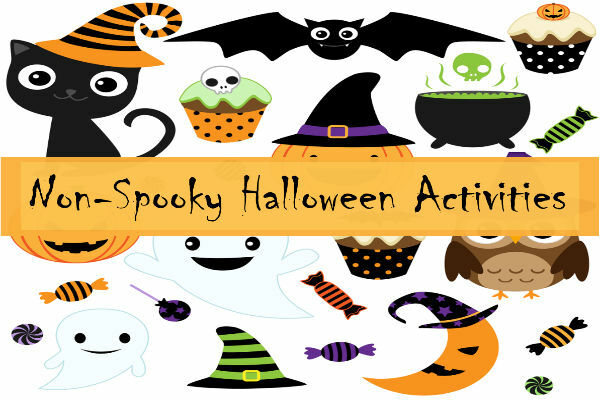 Do you have any favorite non-spooky activities for Halloween? If so, share them for others to enjoy!